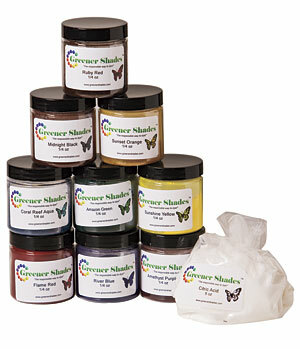 Dye over 13 pounds of yarn and fiber completely guilt-free with this perfect intro-to-dyeing kit from Greener Shades. Not only are these low-impact dyes non-hazardous, non-chrome as well as heavy metal-free but they also wash fast and exhaust well. Additionally, Greener Shades dyes follow the standard set forth by the Organic Trade Association's standard for organic fiber processing. Perfect for the beginning dyer or those looking for an environmentally-friendly alternative. Note: The Coral Reef Aqua dye does contain copper compounds. For more information, see the Greener Shades website FAQ. I love Greener Shades Dyes. I do more Earth tones but I have a friend who says the brighter the better and we spent the day dying and Man did we rock the color wheel. Everything was beautiful. Her's were bright and Mine were Earthy ... And I love the fact that with the book you only need a place to store 9 colors Not a cabinet to store a ton of different ones. These Dyes make dying simple, fun and more importantly EASY to get the look, color and affects you want in your yarn. I've used these a TON now and saturation was NO problem. For the aqua and the black, make sure you check the pH and temperature, and you should have smooth sailing! I LOVE this product. I bought this set as a newbie dyer, and I've used most of it and expanded my collection by now. Some colors work better than other in this set. Particularly the Midnight Black and Coral Reef Aqua, I was not able to get the saturation that I wanted. The Midnight Black almost without exception washes out brown no matter what I tried. The coral reef aqua bleeds like crazy when washing afterwards no matter how little or how much saturation you try for, and even if the dye bath runs clear. I was able to get more ideal results from the other colors, but still not the amount of saturation I had hoped for. If you're interested in dyeing lighter tones I'd go with this set. If deep saturated color is what you're after I'd go with the Jacquard dyes instead. I've never dyed yarn before so this set of starter dyes was my first try. It was used on bare superwash yarns. I was a little worried because the instructions the dyes came with were for kettle dyeing and I was interested in "painting" the yarn so it took a little bit of experimentation to figure out what to do. What worked was soaking the yarn to get it wet, mixing the dyes with water and a bit of the acid crystals that came with the set and then pouring that onto the wet yarn. The yarn soaked up the dye quickly. It was interesting to watch the dye being removed from the water even before cooking it to set it. To get an even distribution of color, it was helpful to pat the yarn to push the dye through all the strands of yarn. Gloves are needed for this. :) We ended up with beautiful vibrant colors. When the yarn was rinsed after "cooking" it, the water ran clear. The colors really shined after the yarn was dried. I can't wait to dye my next set of yarn! !